Disney Does It Again! Delivers the requisite feel good family show utilizing all the resources at hand. The delightful 1992 animated film is now brought to glorious Technicolor life thanks to the efforts of a crack team: Director/ choreographer Casey Nicholaw has done a complete turnaround from his smutty Book Of Mormon with this not quite sanitized version propelling his large cast of 35 from scene to scene and production number to production number ablaze with the magnificent efforts of costumer Gregg Barnes who has added feathers, sequins, fringes, whatever to the expected array of bangles, baubles, beads, inhabiting and all but overshadowed by Broadway veteran Bob Crowley’s glittering and glitzy Vegas inspired sets. An otherwise foreboding cave into which Aladdin must go to find the magic lamp becomes a gold and silver emblazoned fantasy, trees laden with gems and gorgeous girls in a Bollywood-like musical number offering gifts of unimaginable opulence. In contrast to this deliciously over-the-top “Cave of Wonders” is a scene of such breathtaking beauty in the “A Whole New World” sequence it will not long leave your memory. It is what photographers call the “money shot” and, whatever the cost, it is well worth it, in which a huge, glorious moon, surrounded by a black star studded sky is glimpsed through circular window in the palace wall. 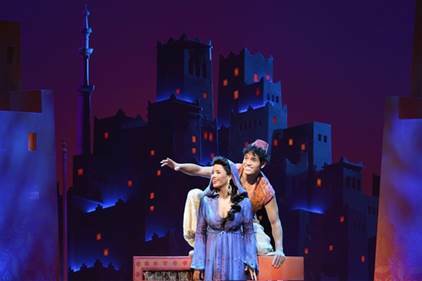 Aladdin and Jasmine step through the window and onto a waiting magic carpet, seemingly suspended in air through the entire sky and over the village below. The finishing touches are provided by Natasha Katz’ lighting and Ken Travis’ sound design. It all adds up to true Disney magic. The late Howard Ashman and Alan Menken (The Little Mermaid, Beauty and the Beast) wrote 11 songs for the film, many of which were cut and now appear in the stage version. 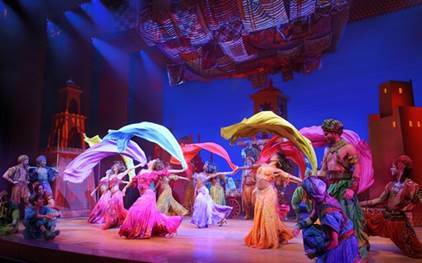 Tim Rice added the lyrics for several new songs including “A Whole New World.” Chad Beguelin was enlisted to add additional lyrics and adapt the screenplay for the stage. In fact, Nicholaw, Mencken and Beguelin collaborated on a whole new song, “Somebody’s Got Your Back,” for new characters, Aladdin’s three friends, Babkak (Brian Gonzalez),Omar (Jonathan Schwartz – no, not that Schwartz) and Kassim (Brandon O’Neill), who replace the monkey in the movie, free him from the dungeon. And how successful is a monolith that can steal from itself to enhance its current production as this one does with snatches of songs from other shows like “Beauty and the Beast.” Music supervision, incidental music and vocal arrangements by Michael Kosarin and orchestrations by Danny Troob complete the musical picture. The result is a magic carpet of music that buoys the entire production. While it seemed appropriate to open this review with the sheer audio/visual physicality of the production, there is one element that supersedes all: the Genie. 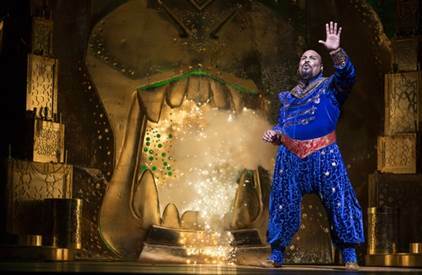 The discovery of the night is a relative newcomer named James Monroe Iglehart, a name to remember, who, while not “new” (he originated the role of Bobby in Memphis and was in The Wiz), opens and closes the show and carries it along its merry madcap way. While the uniquely iconoclastic Robin Williams dominated the movie, imagine that unfettered and amorphous persona and now add flesh and blood, singing and dancing. Fleet of foot despite his notable heft, Iglehart (get used to the name) sweeps us along this adventure while maintaining the central thread of a well-meaning giant who just wants his freedom while helping those around him and dispensing such well-intended moral lessons like “just be yourself.” And he stops the show many times over from when he first emerges from his lamp to sing the manic “Friend Like Me,” to closing the act with what starts as a curtain front duet with Aladdin that morphs into an all-ensemble tap finale combining “A Friend Like Me” with “Proud of Your Boy.” From showbiz shtick, poses, motor-mouthed hilarity and general geniality, this genie is positively endearing. Just as The Lion King embellished and embroidered a simple story with stagecraft, at heart the fairy tale of Aladdin, a poor, streetwise commoner meets the bored, rebellious Princess Jasmine on a flight from the palace and the unlikely couple fall in love just in time to avoid her forced marriage, by law, to a prince (and not the “prince among thieves”) persists. All the required Disney elements are there: attractive romantic leads - as Aladdin, the young thief of Bagdad adept at stealing anything, mostly a loaf of bread which he is likely to give away to someone in worse straights than he is, Adam Jacobs is PG cute more than hunky, despite his bare chest. His salvation seems imminent when he sings “Proud of Your Boy” attempting to reform from his thievery and make something of himself. As Princess Jasmine, the rebellious women’s lib predecessor, who falls in love with a commoner rather than marry a rich prince as prescribed by law, Courtney Reed also keeps the PG image making her somewhat seductive harem costumes seems relatively modest. Snappy villain Jafar (Jonathan Freeman making a bit of show biz history by continuing the role that he originated in the animated film in onstage flesh) oozes malevolence in the family friendly way. His pint-sized pop-eyed sidekick Iago (Don Darryl Rivera) is a visual joke even before he does anything. It’s so nice to see Broadway veteran Clifton Davis back on the boards as the Sultan. Just when you think you’ve seen it all, there is more as one brilliant production number follows another. The energy never falters, and neither does the talent. Warning: Do not see another show for at least a day till your eyes can readjust to the merely earthbound. Aladdin begins previews tomorrow at the Prince Edward Theatre in London's West End.